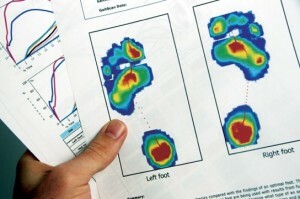 TOG GaitScan™ is the most technologically advanced gait analysis tool on the market! Our body is an open kinetic chain where the only source of stability is the ground beneath your feet. Every step you take impacts your muscles from your feet all the way up to your neck and head. Fix your feet, fix your pain! ** Most insurance plans include benefits for custom orthotic inserts, sandals and shoes. Are your feet sore on a regular basis? Do you have heel pain on a regular basis? Do you walk or stand for long periods? Do you play sports regularly? Does walking or running result in joint pain in your ankles, knees, hips or back? Are you more than 7 lbs over weight? Do you have visible foot problems such as bunions, fallen arches, calluses or corns? Do your feet toe-in or out when you walk? Do you have a family history of foot problems?